Mosquito Mesh for Roll Away Door, Welltech Systems. Life just gets better with the Roll Away Door Screens. Welltech Systems manufactures employing the highest quality fiberglass mesh with recognized engineering skill. Welltech Systems products are easily installed and will last the lifetime of the building when properly maintained. Roll Away Screens for doors enhance the beauty and dignity of a well-planned home. The Door Screening system won’t block your home’s grand entrance, or interfere with door functioning. They simply let cool breezes in and flying mosquitoes and bugs out. News Paper Articles, 26, October, 2012, Welltech Systems, Hyderabad, India. 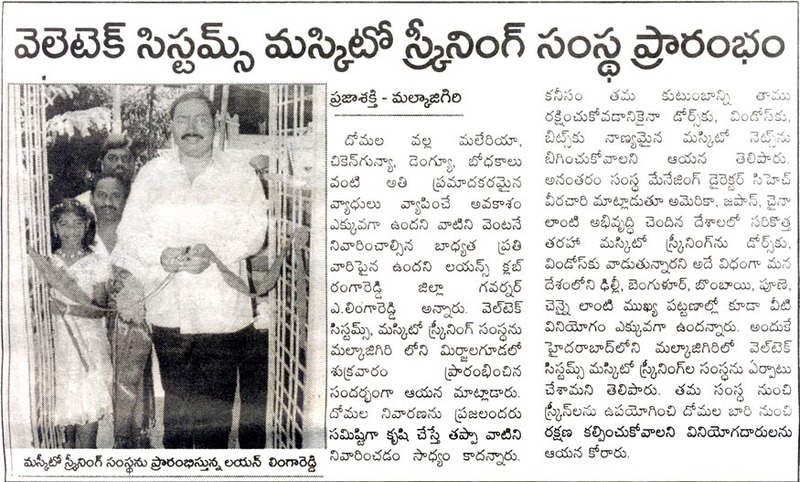 Welltech Systems, New Workshop Inauguration at Malkajgiri, Hyderabad covered by various News Papers on October, 26, 2012. Namaste Telagana News Paper Article Inauguration of New Workshop of Welltech Systems, Hyderabad. 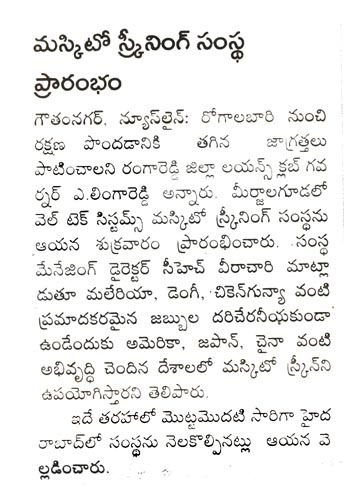 Eeenadu News Paper Article Inauguration of New Workshop of Welltech Systems, Hyderabad. Surya News Paper Article Inauguration of New Workshop of Welltech Systems, Hyderabad. 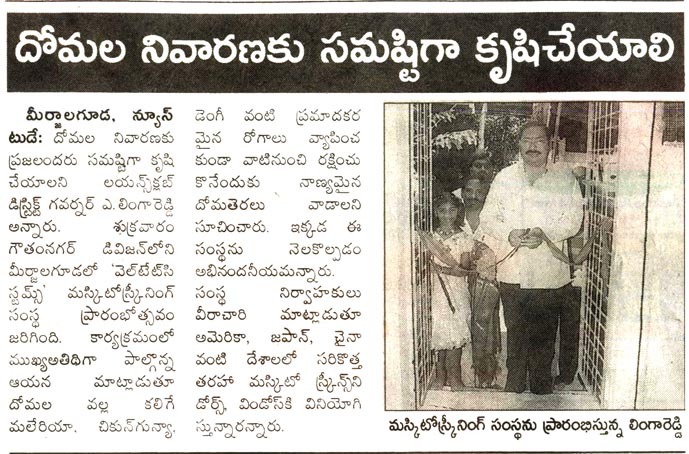 Praja Shakthi News Paper Article Inauguration of New Workshop of Welltech Systems, Hyderabad. 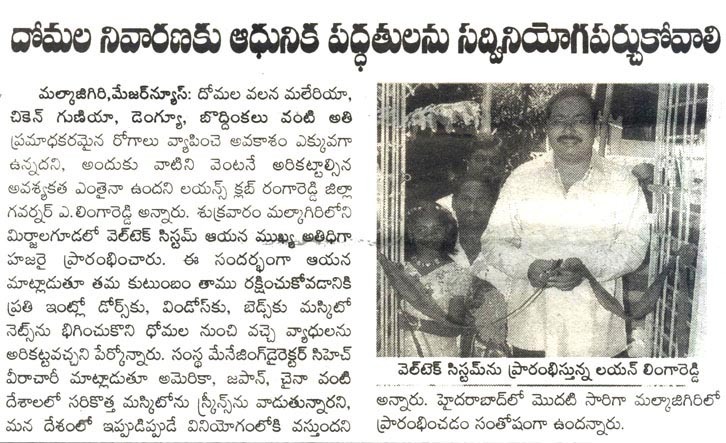 Vishal Andhra News Paper Article Inauguration of New Workshop of Welltech Systems, Hyderabad. 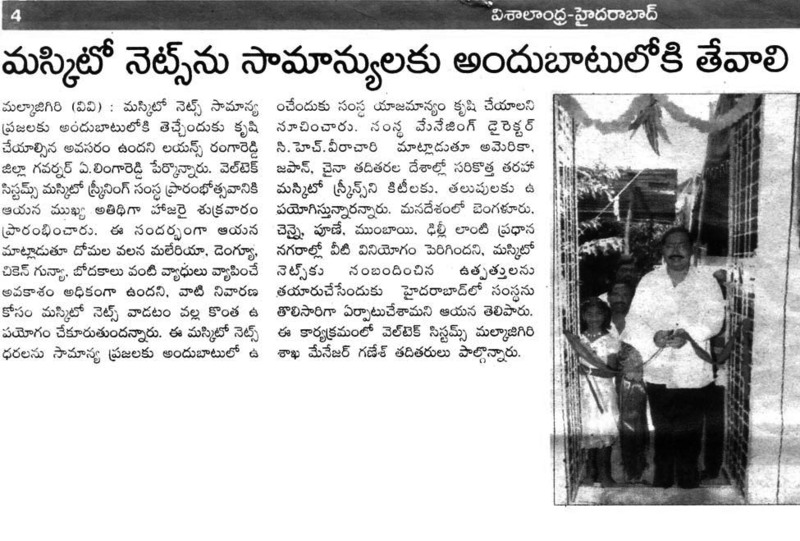 Sakashi News Paper Article Inauguration of New Workshop of Welltech Systems, Hyderabad. 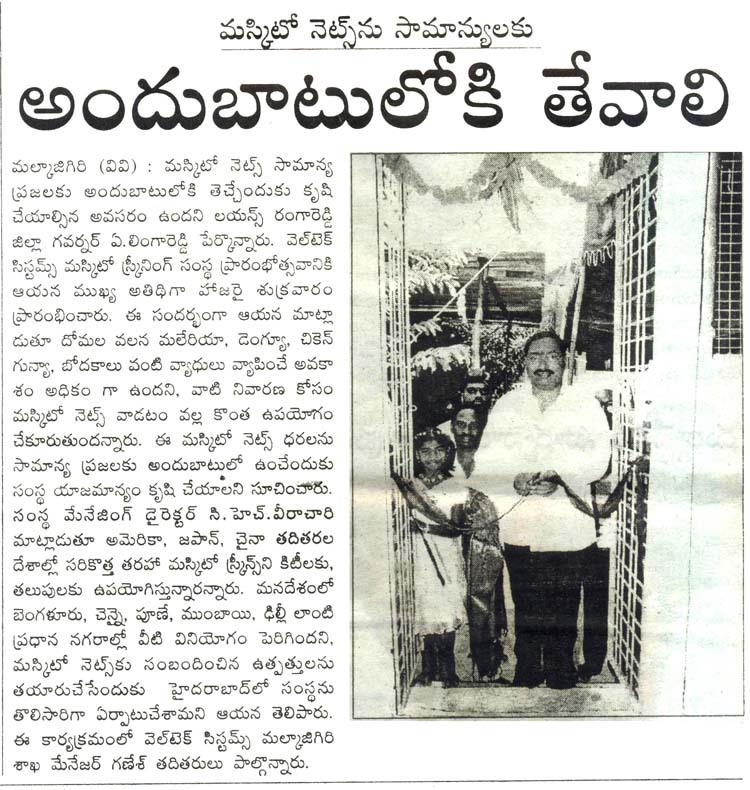 Andhra Jyothi News Paper Article Inauguration of New Workshop of Welltech Systems, Hyderabad. Welltech Systems, a leading manufacturer and fabricator of mosquito mesh for windows and doors, started a new workshop in Malkajgiri, Hyderabad. They invited Ranga Reddy District Loins Club Governor, Lion Linga Reddy as a chief guest for inaugural function at Malkajgiri. Lion Linga Reddy in his speech appealed the society that its everybody’s responsibility to eradicate Mosquito’s as Mosquito bites causes dangerous diseases like Malaria, Dengue, Chikungunya, Brain Fever, Filariasis and other more diseases which spread very fast in many areas. Since it is very easy for children to get acquainted to such type of diseases. He also said that it can be done through collected effort by everyone to control all these diseases and follow the cautions and suggestions given by Municipal Authorities, GHMC, Doctor’s, Medical welfare organizations etc. Its not just government duty to take steps to reduce mosquito menace, we should also try to take a step forward to make it happen. Welltech Systems took a step forward by providing these type of mosquito nets, screens, mesh for homes, apartments, villas, offices etc and very much in reach to common citizens in Hyderabad. To make it happen Welltech Systems Manager G Ganeshwar Rao, Bhanu Prakash, B.Kranthi Kumar, N.Satyanatrayana, Chander, Sai Kumar, K.Vijay Kumar and others took responsibility to educate and make it happen to reach everyone in and around Hyderabad. Double Screen Door System, Hyderabad. A double screen door system using the Welltech Systems Double Screen Door which is made of Aluminum profiles and reinforced corners with high grade Nylon. and also available in one side fold able door.